Item Number: 438-6-25 19455 Actual Weight: 50 lbs. 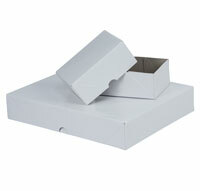 Two-piece folding boxes are ideal for packaging letterhead, business cards, and other items. Lightweight and easy to assemble. This box size can be used for letterhead paper. Chipboard thickness is .032.